At every bath time our golden retriever, Arthur, is there. I like to think he’s watching over her in her bath, but I’m pretty sure he’s just curling up on the warm bath mat. He will be 12 this year on Cinco de Mayo, a year older than our oldest child. Arthur was our practice baby, he was the one we took out at 2 am for potty breaks and he slept in our bed until he got so big he began taking it over. He chewed up a good deal of our foot rails in the house, and had a fetish for the noses on the stuffed animals so a lot of them had to be tossed out. He liked to climb on the couch with his back to me so he could throw himself backwards onto my lap and snuggle like a big baby. Now days while he still makes it up the stairs at night for bed, he doesn’t do much more. I’m not sure how much more time we have with him, and although he makes a terrible guard dog (we had a break in once that he slept through entirely, up until the police left) he is the perfect dog for our kids. 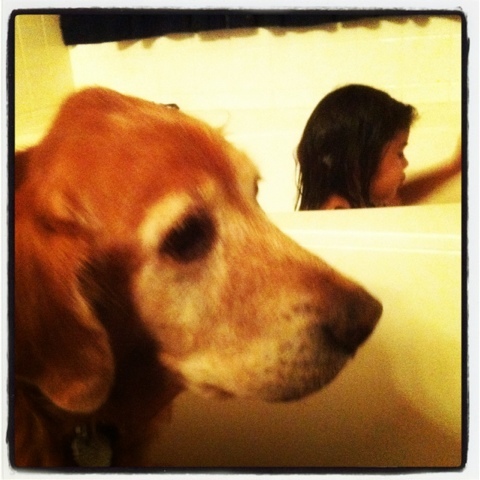 This entry was posted in Parenting, Project 366 and tagged baby, Bath, dog, golden retriever, Instagram, old, project 366. Bookmark the permalink. Arthur also loves to eat Christmas ornaments, especially the crunchy ones. And we have video evidence! Deeply sorry to hear how Arthur’s days have been treating him lately and I saw the message from the boss the morning. I hope y’all are doing well and thankful for just how great Sir Arthur is! Glad to hear he had a full loved life with probably the most caring family I know. Thank you so much. We are lucky to have such a great dog around.